Karli shared this with me... It's so true it hurts. I'm sitting in a blanket bleary eyed this morning... Last night I'd curled myself into a black hole of a ball after possibly the longest day anyone has ever had. Karli shared the Picture above with me because she knows who I am and what motivates me. 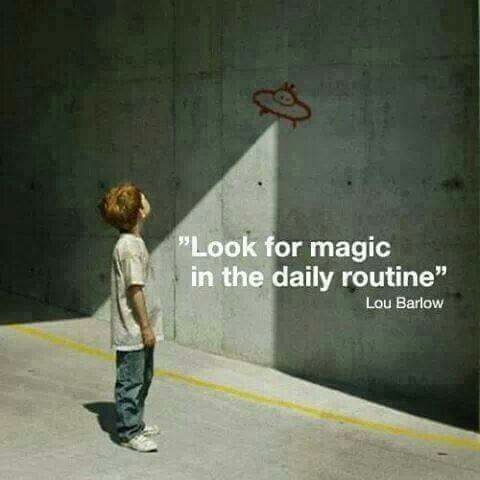 Look for magic in the daily routine; that's me down to a tee. Everyday I walk up and down Millennium Bridge, through Temple Bar and up George's Street and Aungier Street. However everyday is a new adventure, even on the same path. I look out for new things and new experiences in the mundane of the daily routine and it adds so much to what would otherwise be a dire experience.